January Media digest with Forbes, Financial Times, Euromoney, South China Morning Post and more! In this month’s media digest: green bond market forecast by Moody’s, HSBC, S&P and Climate Bonds Initiative, 2018 sustainable debt products performance by Bloomberg New Energy Finance, City’s first green bond, planned green bond from Egypt, FTSE index tracking Chinese green bonds, Climate Bonds Standard certified bonds and much more market and Asia news. Moody’s latest report forecast 20% green bonds market growth in 2019 - to $200 billion. HSBC predicts $180 in line with S&P Global Ratings. In a client report published on Thursday (January 31), Moody's Investors Service has forecast a 20% annualized jump in issuance to $200 billion in 2019, citing continued issuer diversification and greater clarity around standards that have been providing a boost to the market. Moody's said investor demand for "green" and sustainable products was outpacing the supply of such products and increasing government commitments to address climate change would sustain growth in the green bond market. The forecast is above expectations by HSBC of $140-180 billion and S&P Global Ratings of $180 billion this year. Supply growth should reignite when EM markets stabilise and as green capex rises in response to climate change damage,” HSBC analysts said. HSBC expects a boost in supply of green, social and sustainability (GSS) bonds in 2019, with as much as $250 billion in total GSS bonds, up from $199.5 billion in 2018. En opinión de S&P Global Ratings, los sólidos fundamentales del mercado y un flujo continuo de nuevos emisores e instrumentos de financiación pueden impulsar la emisión verde a alrededor de 180.000 millones de dólares en 2019 desde un récord de 167.000 millones en 2018, según Climate Bonds Initiative. Selon S&P Global Ratings, les émissions d’obligations vertes pourrait atteindre 180 milliards de dollars en 2019, et résister à la baisse du marché mondial des titres à revenu fixe après un niveau record de 167 milliards en 2018. Analysis from Bloomberg New Energy Finance showed that overall issuance of sustainable debt products in 2018 surged 26 per cent with green bonds making up the largest part of the market. However, with experts warning green investment levels need to continue to grow rapidly throughout the 2020s in order to meet global targets set by the Paris Agreement and UN Sustainable Development Goals, observers will be hoping the green bond market accelerates again during 2019. While the volume of green bonds issued rose just 5% on 2017, to reach $182.8 billion – compared to growth of 68% 12 months earlier – BloombergNEF said today that the volume of sustainability-linked loans was up 677% year on year, to $36.4 billion. Kate Allen explains how selling the green bond creates a valuable dialogue between borrowers and lenders. 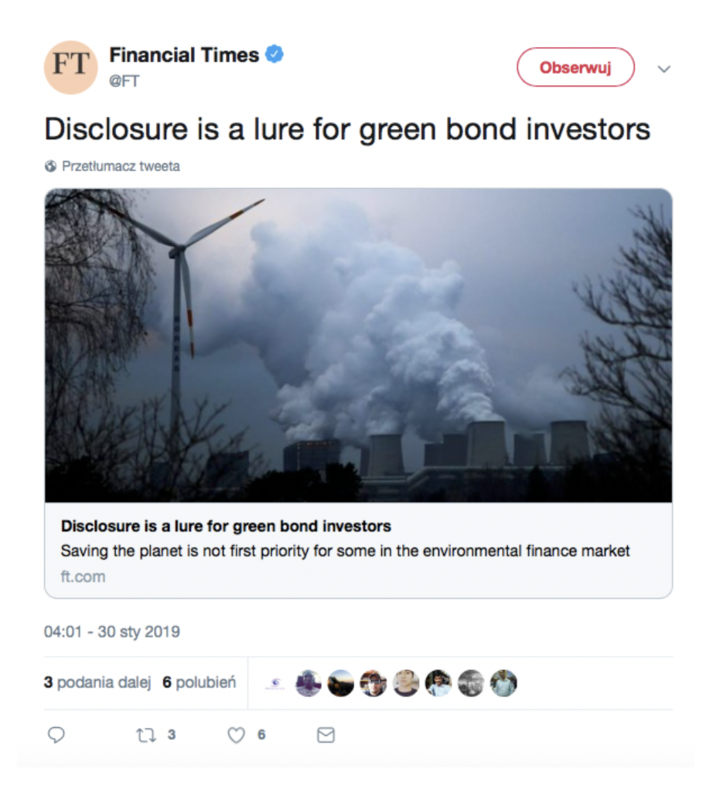 For some investors, the growing popularity of green bonds is primarily about corporate disclosure rather than saving the planet. Some in the bond markets admire the level of engagement companies have with their shareholders. From this vantage point, the process of assessing green credentials is a healthy example of the emergence of activist investing in the debt markets. El Economista quotes Swedish bank SEB and Climate Bonds Initiative both predicting 2019 to be a year of new impetus in green bonds issuance. Sin dejar de mencionar que se prevé que las políticas públicas para impulsar la innovación y el financiamiento verdes en algunos países den un nuevo impulso durante el 2019. En este sentido apunta a un potencial de crecimiento de entre 210,000 y hasta 240,000 millones para todo este 2019. Green sukuk story that starts with the world’s first Islamic green bond issued by Malaysia in 2017. It isn’t surprising that the first Islamic green bond took place in Malaysia. After Japan and South Korea, the country is Asia’s third-largest bond market as a fraction of GDP. It is also the world’s largest sukuk market. The Mission 2020 campaign lists milestones in six areas that have to be achieved in order to avoid warming beyond 1.5°C target. One of them is finance with critical role of green bonds. Important signals toward this milestone include a 10-fold increase in philanthropic funding for climate action and in green bonds; taking climate-related financial risks fully into account; eliminating fossil fuel subsidies; canceling capital expenditures for coal, oil and gas production; and implementing carbon pricing in all major economies. ETF Trends shares a video from the World Bank that recounts an insider story of the first green bond ever issued. It provides insight to how emergence of green bonds impacted the financial community of today. Summary of Climate Bonds Initiative’s report “2018 Green bonds market summary”. 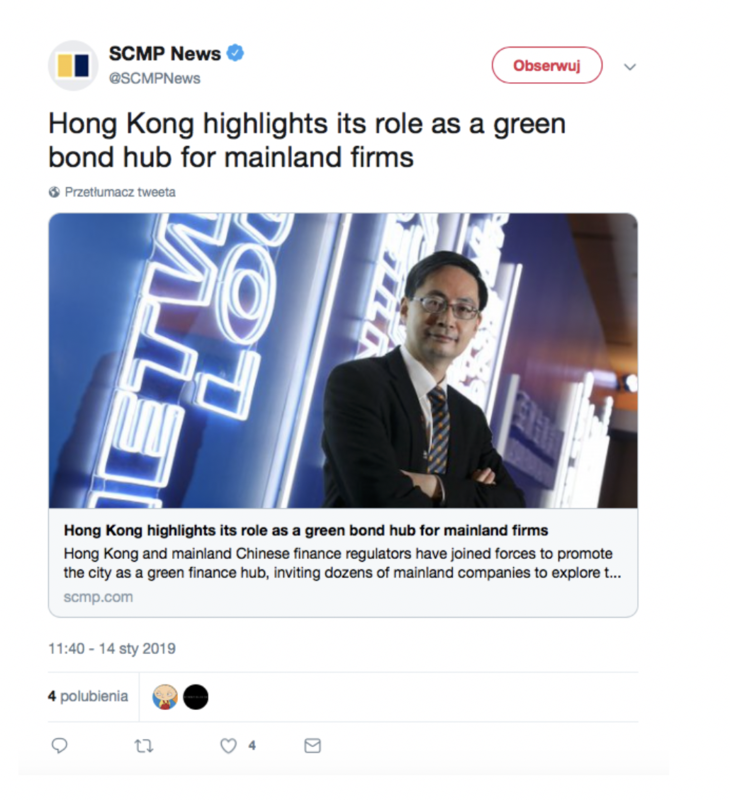 Financial corporates issued USD 49 billion worth of green bonds, or 29% of the 2018 volume. Climate Bonds pointed out that this is the first time since market inception that financial corporates have the largest share of annual volumes. Author argues US needs a public development bank to help funding country’s infrastructure needs and quotes the success example of Germany’s public sector development bank KfW that issued multiple green bonds and financed country’s transition to renewable energy. The [green] bonds are financed by KfW from the proceeds of its loans, which are also in high demand due to their low interest rates, which the bank can offer because its high ratings allow it to cheaply mobilize funds from capital markets and its public policy-oriented loans qualify it for targeted subsidies. Authors of the article explain how the certification under the Climate Bonds Standard works. The most prominent standard used to verify the status of bonds as 'green' is the Climate Bonds Standard published by the Climate Bonds Initiative (CBI). (…) These are based on industry consultation and practical learnings experienced by issuers, verifiers and investors in green finance. The Punch summarises discussion that took place at Climate Finance Accelerator Workshop in Lagos. The Africa Programme Manager, Climate Bonds Initiative, Olumide Lala, stated that there was a need to focus on investments in green bonds. He said investor demand was driving the growth of green bonds in the country. According to him, green bonds can be used as a tool to shift debt capital markets to climate solutions. City issued its first green bond of €1 billion in January. Citi issued its first green bond on Tuesday – a €1 billion three-year fixed-rate note. The bond was larger than anticipated, and oversubscribed, pricing at mid-swaps +58 basis points – in from the initial +75bp area. The firm has put out €1 billion ($1,13 billion) for three-year fixed rate notes, which will fund renewable energy, water quality and conservations, green building projects, and other environmentally friendly missions. The three-year deal marks its first green bond issuance, and charts a new path for a bank that has been highly influential in the market’s development. Planned issuance of sovereign green bond by Egypt also made some media headlines. Egypt plans to issue a number of dollar-denominated and euro-denominated bonds as well as green bonds by the end of this fiscal year in June, the finance ministry said on Monday. JP Morgan, HSBC and Citigroup will manage the dollar-denominated issue, the ministry said. BNP Paribas, Natixis, Alex Bank and Standard Chartered will manage the euro-denominated issue. Egypt will issue new green bonds and Asian currency-denominated bonds for the first time in addition to dollar and Eurobonds in the fiscal year 2018/19, the finance ministry said on Monday. In January, Hong Kong monetary officials invited more than 50 China’s mainland banks and businesses to learn more about green debt issuance. Hong Kong and mainland Chinese finance regulators have joined forces to promote the city as a green finance hub, inviting dozens of mainland companies to explore the benefits of fundraising with a view to ethical and social benefits. South Korea stands a change to become a sustainable finance leader in Asia. (…) the future looks bright in South Korea, with the government focused on creating a cleaner environment by, for instance, pledging to reduce greenhouse gas emissions by 37% by 2030. According to the Climate Bonds Initiative, key factors supporting the growth of sustainable finance in South Korea are national green finance guidelines and tax incentives to incentivize environmental improvement. Separately, FTSE Russell has also launched a new index series tracking Chinese green bonds – “securities whose proceeds are specifically used to finance climate or environmental projects in mainland China”. There are 126 bonds already included in the main index in the new series, covering approximately 75% of all onshore bonds labelled green issued by the Chinese government. FTSE Russell has launched a Chinese Green Bond Index Series in response to strong growth in the country's green bond market. The index will be measuring the performance of onshore yuan-denominated fixed income securities issued by the government, agencies and corporates that have been labelled as “green” by their issuer. Figures from the index provider show that China’s domestic green bond market grew at a compound annual growth rate of 65% since 2015 to approximately US$48 billion at the end of 2017. In January, Climate Bonds Initiative released Spanish version of the State of the Market 2018 report. 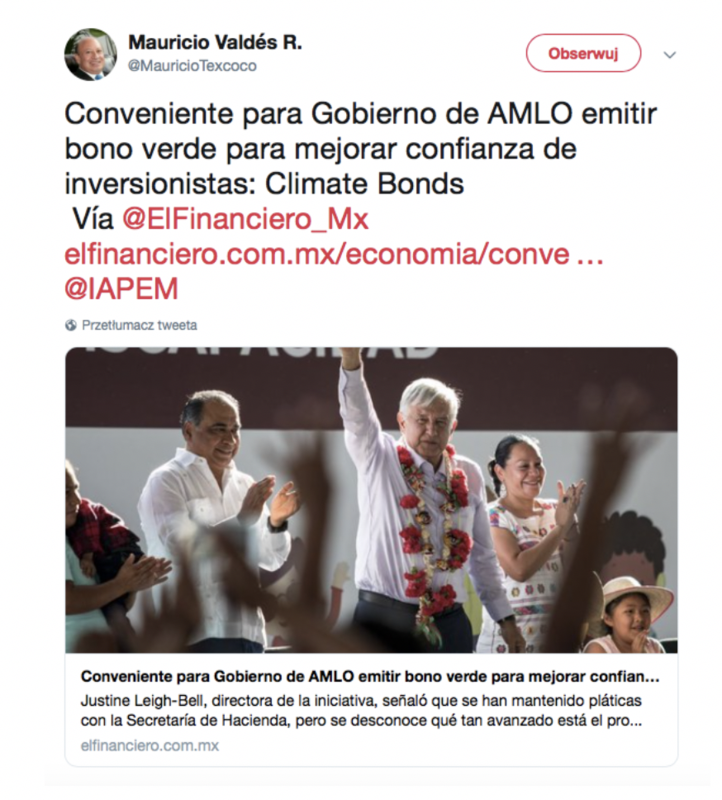 De acuerdo con el reporte del Estado del Mercado de bonos alineados al cambio climático 2018, presentado por MÉXICO2 y por Climate Bonds Initiative (CBI), el universo de bonos alineados al cambio climático es de 1.45 trillones de dólares en circulación. Así lo aseguró la directora de Desarrollo de Mercados de Climate Bonds, Justine Leigh-Bell, quien destacó que hay algunos países en Latinoamérica que preparan ya su primera emisión de bonos soberanos para este año, y México podría quedar al final de la fila. Justine Leigh-Bell, directora de la Iniciativa de Desarrollo de Mercados de Climate Bonds, afirmó que es relevante mantener la confianza del inversionista, debido al tamaño del naciente mercado de bonos verdes en México y por el monto colocado de estos títulos en mercados internacionales para financiar la construcción del NAIM. Leigh-Bell dijo tener conocimiento de algunos inversionistas tanto nacionales como internacionales que analizan conjuntamente con la Secretaría de Hacienda y Crédito Público distintos prospectos para emitir un bono verde soberano, aunque desconoce los términos y avances. El gobierno mexicano debe de incursionar en la emisión de bonos verdes para los proyectos, lo cual reduciría la incertidumbre generada por la cancelación de los bonos del NAIM, incluso ayudaría a impulsar el mercado en el pais, expuso la directora de Desarrollo de Mercados de Climate Bonds, Justine Leigh-Bell. En conferencia de prensa, consideró que, a pesar de la cancelación del NAIM para el que se emitieron bonos verdes, estos títulos de crédito del gobierno mexicano serían bien recibidos por el mercado, debido a que hay un enorme apetito por este tipo de instrumentos. 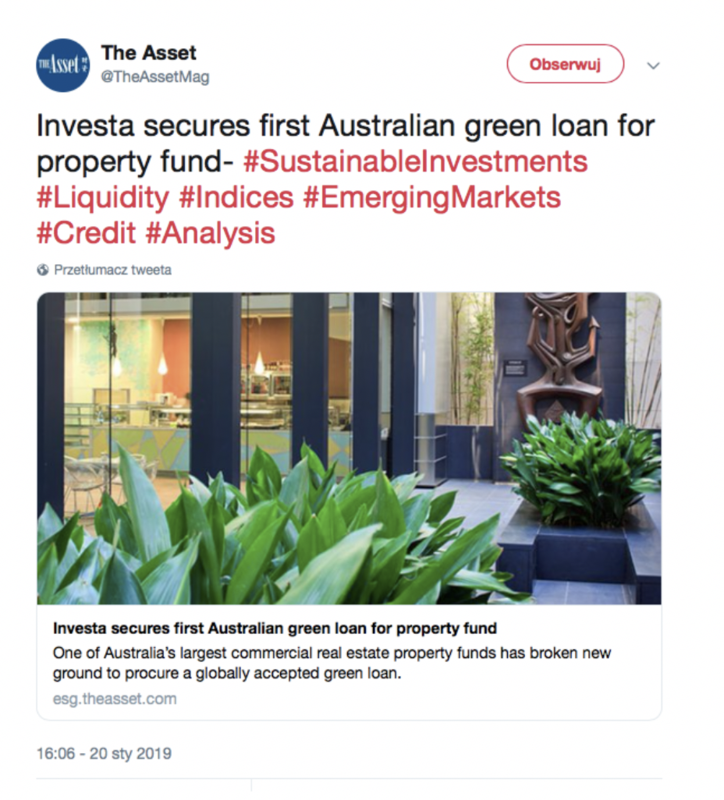 Investa is laying claim to Australia’s first green loan for a $170 million facility that is globally recognised by the Climate Bonds Initiative. The London-based Climate Bonds Initiative, a not-for-profit organization which promotes large-scale investment into the low-carbon economy, has verified the loan. Climate Bonds Standard (CBS) from the Climate Bonds Initiative (CBI) awarded a certification to the said bonds. It will be the first publicly syndicated CBI-certified dollar-denominated green bond in Southeast Asia. AC Energy’s green bond framework sets out well-defined guidelines for use of proceeds for renewable energy projects, with comprehensive monitoring and reporting commitments. The energy arm of Philippine group Ayala Corp (PSE:AC) has raised USD 225 million (EUR 196.8m) from its inaugural offering of senior green bonds that will help it expand its renewables business.